The premier KISS tribute band, KISS ARMY has taken over 10 years and 1000+ shows to become one of THE best “classic” KISS tribute bands around. Hailing from the Louisville, Kentucky area, the band consists of an amazing cast of actors/musicians that create the mega-successful tribute band that is even endorsed by former KISS manager, Bill Aucoin. Mr. Aucoin introduced the band at its ATLANTA KISS EXPO performance and said some pretty kind words about the band. That’s a pretty hefty stamp-of-approval, especially when you think about how many KISS tribute bands there are out there! Steve Clark (Peter Criss) took some time to answer a few questions about KISS ARMY. Steve Clark: Honestly, there simply IS no competition to “KISS ARMY” in my eyes. We only learn from 'our' mistakes from having so much experience. I'd like to say it's 'friendly' amongst other KISS tribute bands, but the ones that we get along with best are simply the ones that are honest fans in the first place and understand why we do this at all. KISS ARMY has went through a metamorphosis since it's incarnation in 1996 and member changes have become 'part' of simply getting it 'right' on overall spirit to perfect and dial in the ultimate KISS live spectacle of the 70's. ALL that have participated have helped to make it what it's become today, but it's extremely important to see the 'whole' picture and not just get the 'idea'. Of course, it's not easy to live with each other while touring for such long periods of time either, and you need peace amongst each other all around to make anything substantial happen on a regular basis. E.C. : What are your study tools? Do you use any unreleased videotapes, etc? Steve Clark: Videotapes, audiotapes, magazines, interviews and classic marketing styles are the only format we know to utilize. E.C. : How do you pick the songs? Just the hits, or any of the lesser-heard KISS songs? Steve Clark: We pick a nice rounded classic live show that's expected by most, if not all, to be played live - and then simply add some extra stuff from our own personal favorites list. Steve Clark: Yes, we do this full time, and have since 1992 in various formations. And this could go on for as long as we believe in it as a 'group'. E.C. 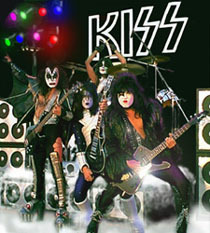 : Are there are legal issues that you have encountered doing a KISS tribute show? Steve Clark: Just the typical pyrotechnics issue, which we only use in approved situations that are of no danger in any way, shape or form. And honestly, it should be a top-notch act before you have to consider the bells and whistles. E.C. : With the pyrotechnics accident at the recent Great White show - will this change the way that KISS Army does its show in any way? Steve Clark: We've already begun to take extra precaution long ago and hope the fans understand that it's the 'band' that needs to be the 'show'. Anything else simply adds to the excitement. But only in the safest of situations will pyro be part of the show, and that comes with written approval from the owners of the venue as well as approval of the local Fire Marshall after demonstrating what would be used throughout the entire show. This is mandatory before we'd ever consider lighting a match. E.C. : You got Bill Aucoin's endorsement onstage at the Atlanta KISS Expo. So, I guess that means that you guys are the "hottest KISS tribute band in the land"?